Swiss fish keeper and breeder and long time Planet Catfish contributer Yann Fulliquet introduces this months craggy headed featured species. 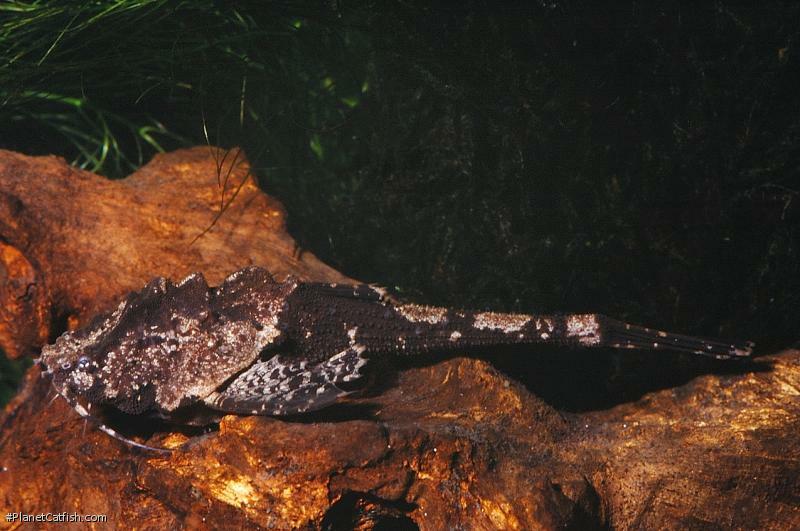 With the exception of Bunocephalus coracoideus, catfish from the family Aspridinidae are not commonly encountered. However, these imports bear further investigation. Basically you will find a range of species sold under this name (or the common name Banjo Catfish) as exporters, importers and many retailers alike really don’t bother checking the true identity of the fish they are handling. Once in a while you will find an odd looking Bunocephalus, and this strange looking fish will be B. verrucosus. Unlike other members of the genus, this species is rather high bodied and doesn’t spend the whole day buried into the sand. Bunocephalus verrucosus was first described in 1792 by the German born doctor and naturalist Johann Julius Walbaum under the name of Silurus verrucosus. The species was further known from two subspecies, B. verrucosus scabriceps and B. verrucosus verrucosus . The former is now considered as a synonym, but you can still differentiate by the shape of the back. I did find a pair of these unexpectedly in a local fish store back in the late 90’s. It was love at first sight and after researching the fish and their care, I brought the pair back home. They were kept in a heavily planted tank. The tank can be planted or not, the bottom should consist of sand and a leaf litter with some pieces of wood. A small current will keep the water oxygenated. The water should be rather fresh, they do better as such but they can be kept at a temperature of 28°c without a problem. Other parameters are not so important as long as the water is clean. In planted tank they can be seen sometimes hanging in the vegetation. Unlike other Aspredinidae, Bunocephalus verrucosus doesn’t bury in the sand, it usually stays motionless on the substrate, hardly moving. When it does, it won’t use its fins like most other fish would do. It is the first fish I witnessed using hydropropultion, that is, taking water in its mouth and expelling it through the gill opening to produce forward thrust. It is quite comical and unexpected to see it swimming like this. When you catch these, they tend to bend sideways. Be careful not to place your finger at the side of the body and in reach of the pectoral fin, as it will clasp it to its side, and since it is well serrated, it does hurt. The fish won’t let go, no matter how loud you scream. Once you drop it back into the water, the fish will literally fall to the bottom like a piece of wood and lay there motionless. Sometimes you can really wonder if these fish are alive. Feeding can be tricky, remember, they are not an active swimmer, other species of the genus appear hyperactive by comparison. So either you keep them with species as active as they are, or you can hand feed them. I have done so with them without any problem; they will accept all types of food, live, frozen, flakes, pellets, tablets. Small portion of tablets would even be swallowed in one piece. Identification A high, ridged back distinguishes this species from other common banjo catfish imports. Also, the coracoid process extends back nearly to the origin of the pelvic fin; longer than the coracoid of Bunocephalus coracoideus. Sexing Females have a rounder belly when look from above, especially in the region of the starting of the caudal peduncle. Other Parameters No special requirements in regard to water parameters. Preferably no nitrites and nitrates as low as possible. Feeding Unproblematic, the fish accepts most foods. Best fed after lights out. Only settled or very hungry fish will search for food during the daylight hours. Once accustomed, can be hand feed. When hand feeding can be fed any time, even with the lights on. Furniture A sandy substrate is suggested although this species doesn't readily burrow; you could experiment with leaf litter. Appears equally at home in dense vegetation and resorts to burrowing if no other cover available. Compatibility Peaceful. Care should be taken not to house this fish with any species that may seriously deprive it of food. Breeding Some reports exist that these fish lay their eggs in the roots of floating plants. Exactly how the fish reach these positions high in the water column is not recorded. Although seemingly far-fetched, this report may go some way to explaining young fishes love of hiding in leafy plants.